I've never tried Green Works Laundry Detergent or Stain Remover, even though I always meant to, but Mom Central gave me the opportunity recently, for a blog tour. I did try out the laundry detergent, and I loved the smell and how fresh my clothes were when they finally came out. I was able to try it out on my clothes (which I always wash in cold water), as well as my children's clothes, some of which had mud from our rather wet weather we've had recently. Everything was clean and smelled great! I must admit that I was a little worried how my clothes would come out - I mean I've heard of Green Works and I know that Clorox is a trusted brand, but I'm very particular with my clothes, and you just never know... So I'm glad that Green Works worked well and I'll be sure to report back when I get to use the stain remover and tell you how well it worked! 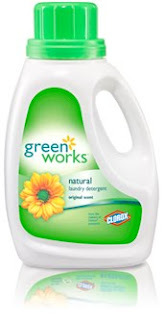 Disclaimer: I wrote this review while participating in a blog tour campaign by Mom Central on behalf of Clorox Green Works and received a bottle of Green Works Natural Detergent and Stain Remover to facilitate my review and a $20 thank-you gift certificate. Was it any better than other detergents?